When I bought my Profoto B1 Off-Camera Flash a few months ago, a big part of my choice was due to the promise that they would be adding a HSS (High Speed Sync) feature. Without getting into the details of how HSS works, I felt that as a fitness photographer, being able to sync my strobe at high shutter speeds would be a great addition to my repertoire. It would allow me to explore lighting in a whole new way, help me shoot in difficult conditions and be able to add an extra layer of production value to my images when needed. My first shoot was with Tayla from Vicious Models. 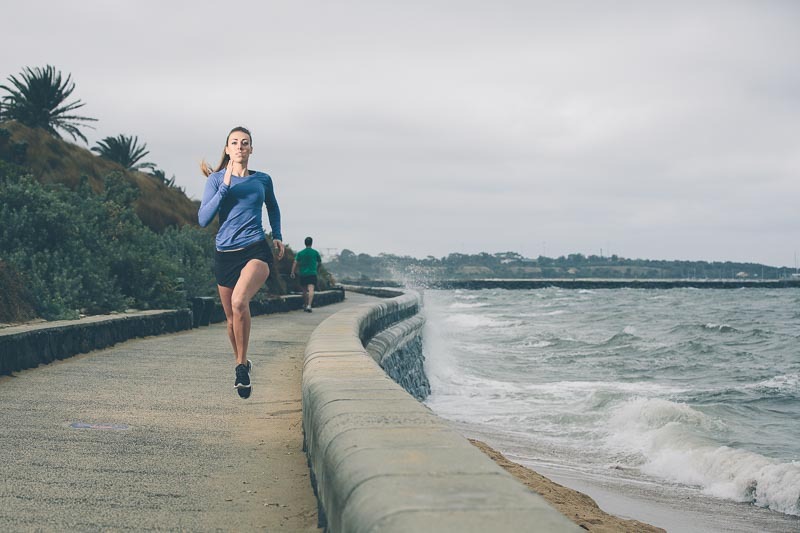 When shooting fitness, I prefer to use very fast shutter speeds to freeze authentic action. This was a good test of how the HSS system deals with high shutter speeds. We shot on the roof of a local parking garage because I wanted to see how the system works in full sun. Other techniques where you can use a strobe in daylight without HSS (such as a ND filter and/or very small aperture), would still have resulted in motion blur captured during the ambient exposure. The weather didn’t cooperate at first, as the day started out cloudy. I set up the Elinchrom Octa on camera right to add some beautiful directional light that would subtly separate Tayla from the background. Here you can see how the addition of the flash adds a beauty light that allows Tayla to stand out in the scene. 1/2000 sec, f/5.6, ISO 400 with Profoto B1 HSS in TTL mode. As you can see, the flash makes a big difference in the scene while still keeping it realistic. The Profoto HSS system was up to the task and I didn’t see any banding that you would usually see if you exceed your camera’s flash sync speed limit. The TTL system also worked as advertised and provided an acceptable exposure. The biggest benefit was that I could shoot at high shutter speeds fast enough to capture action and add artificial light to give the image a more premium look. Using a high shutter speed I was able to freeze the motion of the skipping rope (mostly). Profoto’s HSS allowed me to sync my B1 and add a touch of beautiful light to the image. 1/2000 sec at f/5.6, ISO 400. The biggest issue we faced was the wind. The Octabank was so big that it was acting like a sail. I was lucky to have Fatima assisting me. She had to hold on to the handle or the whole thing may have come tumbling down (with the $2000 plus B1 going down with it). 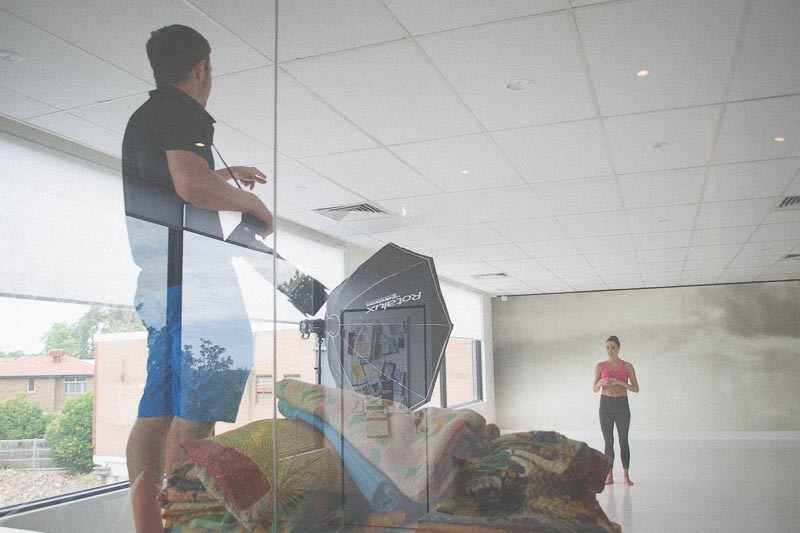 Here you can see me holding the handle of the Profoto B1 while I direct Tayla. The wind would have blown it over otherwise. Image by Fatima. Later in the shoot the sun did come out in full force. By this time I was annoyed enough with the wind that I moved to smaller modifiers. I got in a bit closer with the Profoto Small Deep Umbrella and used it as a fill light on both sides (one at a time). I was able to balance it with the sun but didn’t spend as much time as I would have liked testing it out. We had to move on to the next shoot. The second shoot was at Light Space Yoga and featured Tayla (Vicious Models) again. The shoot was indoors in a space already made beautiful with large, bright windows. My challenge was how to use the Profoto HSS system to add an extra layer of complexity. 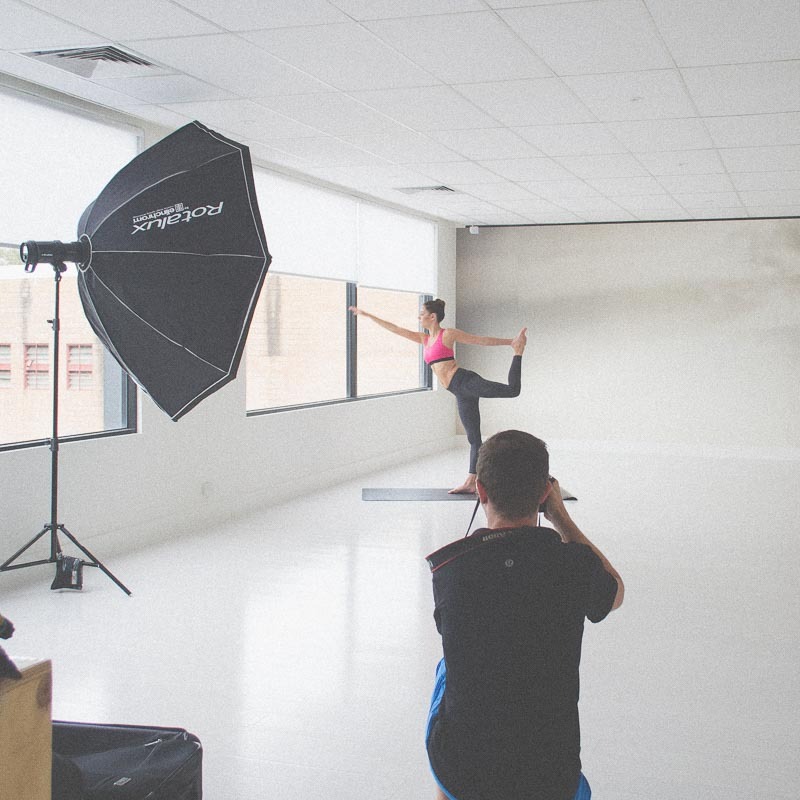 When shooting yoga, I’d ideally like to shoot at least 1/500 of a second. That allows me to let the yogi flow through their practice while I’m there to capture authentic moments. Slower shutter speeds can introduce some motion blur depending on how fast the yogi moves through their poses. If I used to my camera’s sync speed of 1/200 of a second, I would likely get some blurring in such a bright space because of the ambient exposure during the movement. If I were to darken the location by drawing down the blinds, I would lose the essence and beauty of the space itself. Here I am setting up the rim light behind Tayla. Image by Fatima. Here’s an image of Tayla where I turned off the Profoto TTL-C so that the strobe wouldn’t fire. 1/500 sec at f/4.0, ISO 400. In this image you can see the subtle rim light (most obviously on her shoulder). 1/500 sec at F/4.0, ISO 400 with Profoto B1 HSS in TTL mode. In this case I wanted to add a touch of light to Tayla’s side (front of camera) to create a more premium result. Behind the Scenes image courtesy of Fatima. 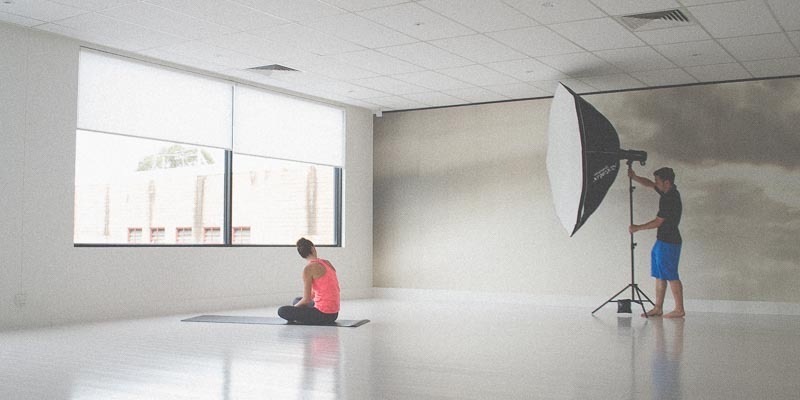 Overall the Profoto HSS system was easily up to the task of shooting yoga indoors. It did change my approach slightly which I’ll talk about in the pros and cons section below. The last shoot I did for this Profoto HSS Review was a run shoot on the coast near Brighton. This time Dezeraie was kind enough to meet up with me. It was even windier than the fitness shoot and I had no one to hold on to the B1 head. I had to use my smallest, hardest modifier; the Profoto Zoom Reflector. Another cloudy day led me to try and emulate the look of the sun peaking through the clouds. Here’s an off-cut that shows how the Profoto B1 with HSS was able to sync at 1/1000 of a second and allow me to freeze the running motion. I was still sorting out the right balance of light and the ambient exposure is darker than I’d like it to be (and there’s a guy in the background of course…). This image is toned but not retouched. In this image you can see that the Profoto HSS system can sync at high shutter speeds and add light to fast action. In this case the power was too high and creates an artificial look. You can clearly see the pool of light that is coming from the light set up on camera left. 1/1000 sec at f/5.6, ISO 800 with Profoto B1 HSS in TTL mode. I found that this set up was looking too fake for what I was looking for, so I choose to make the strobe act as a rim light and not the key light. Here’s two images where you can compare with and without the rim light (toned but not retouched). This test image shows the scene in ambient light (no flash). 1/1000 sec at f/5.6, ISO 1250. This test image shows the scene with Profoto HSS on the B1 coming from camera right creating a rim light. This test image shows the scene in ambient light (no flash). 1/1000 sec at f/5.6, ISO 1250 with Profoto B1 HSS in TTL mode. 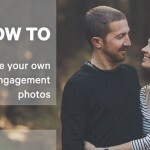 Of course I’m aware that an image with someone sitting doesn’t need a shutter speed of 1/1000 of a second. However because I wanted to test the HSS system developed by Profoto, I chose to keep the shutter speed high. Here’s an image where you can see how you can mix high shutter speeds and Profoto’s HSS system. Here the B1 is providing rim light from behind and to the right of her. 1/1000 sec at f/5.6, ISO 1250 with Profoto B1 in manual mode. This is the best reason to work with a photographer who is comfortable with this system. It can be used to augment the light that already exists in a realistic way or it can be used to create shots with more dramatic, stylized lighting. Sometimes the location chosen for a shoot don’t have natural lighting that fits with the look and feeling you want. Being able to add lights to a space allows you to get exactly what you’re looking for. Being able to use artificial lighting at any shutter speed allows light to be created even when it is not there. In the example of the run test shoot, I could get the look of sunlight peaking through the clouds on a dreary, overcast day. Of course it would be difficult to get a “sunny” feeling on a rainy day outdoors; indoors it would be possible with this system. Since the Profoto B1 doesn’t have to be plugged in and has no wires to get tangled, setting up or moving a light to another location is much quicker and easier than with bigger systems. You can go almost anywhere which opens up new creative possibilities. Since the power of the lights can be controlled from a distance using the Profoto Air Remote, less assistants are needed on set to keep things moving smoothly. If indoors, an assistant might not even be required. Indoor shoots my not require an assistant (unless they’re taking the behind the scenes photos). Image by Fatima. Similar results were only available with medium format camera systems that cost upwards of $50 000 to buy or thousands to hire/rent. 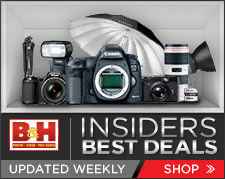 This HSS system works with camera systems that most professional photographers already own (Canon or Nikon). Photographers that own the medium format systems and need more assistants will have a higher overhead which results in higher rates/fees. So unless you need the quality advantage that medium format provides, then you can hire a photographer who has experience working with this HSS system. 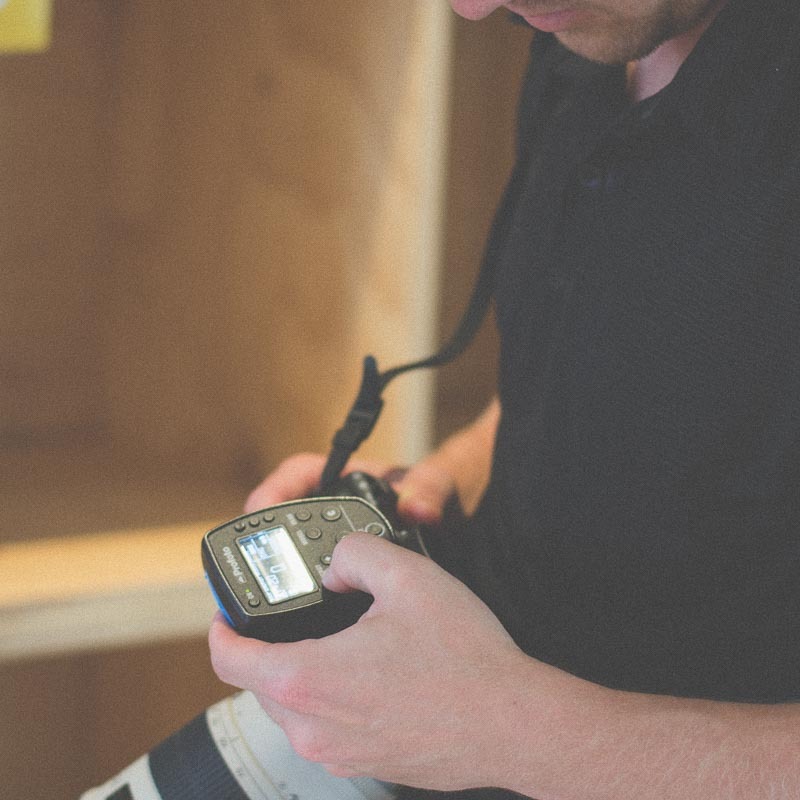 Of course there is always a cost associated with additional gear that’s on set and the expertise required to use that technology to get the desired results. Although this system is great for a variety of uses, there are still some projects that need higher-end gear. The biggest advantage of using this system is power. Both my Canon and Nikon speedlights (yes I shoot both) have similar features but don’t have the same light output. 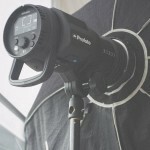 The Profoto B1 is around 10 times more powerful than those speedlights. 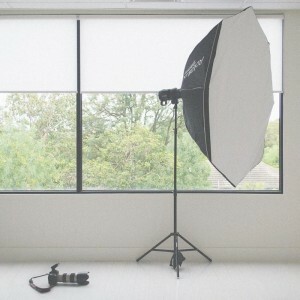 This allows you to set your light up further or use a larger modifier. More power gives you more flexibility. Canon cameras can sync all the way up to a maximum of 1/8000 of a second while Profoto suggests not going past 1/4000 of a second on Nikon cameras. 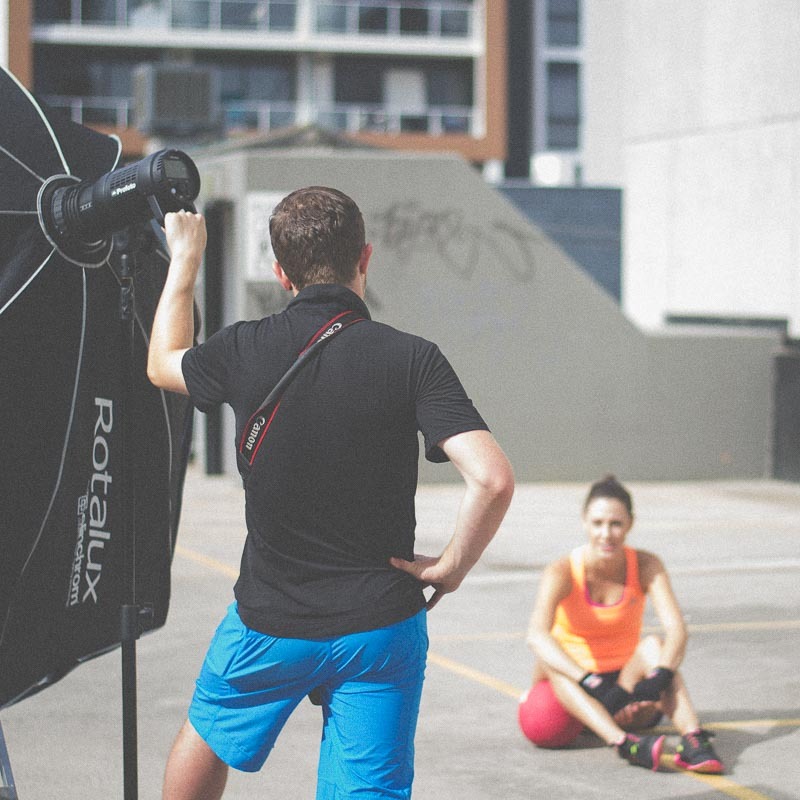 It’s very exciting as a fitness shooter to be able to add flash at any shutter speed. Although I’m not sure why there’s a difference for Nikon shooters, for what I shoot, 1/4000 would be adequate in most situations. 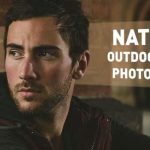 Portrait shooters have often complained that shooting outdoors with a strobe at a wide aperture is impossible unless you use an ND filter (which may affect auto-focus accuracy). There is no limitation to what aperture you can use with the Profoto HSS system. Neil van Niekerk has expertly demonstrated this benefit by testing some portraits shot at f/1.4 with the Profoto B1 and HSS. This allows you to have an extremely shallow depth of field and beautifully blurry backgrounds even when using flash. Most photographers who need to sync at high shutter speeds use leaf shutter lenses that are only available with expensive medium format camera gear. I know that it provides a greater depth of colour and detail compared to 35mm DSLRs. However, I have heard from other photographers that these medium format systems work best at low ISOs. Especially with older digital backs, the image starts to break down ISOs that are easily handled by cameras like my Canon 5D Mark III and Nikon D600. Since these Canon and Nikon cameras have such great high ISOs, you suddenly can pair that capability with the Profoto HSS system to get results that were not possible before. I don’t tend to shoot TTL when I use flash, but for this test I tried it out. I found it to work as advertised, providing an accurate flash exposure for my subject. It was a great way to get in the range that I wanted and then switch to manual to keep the look. 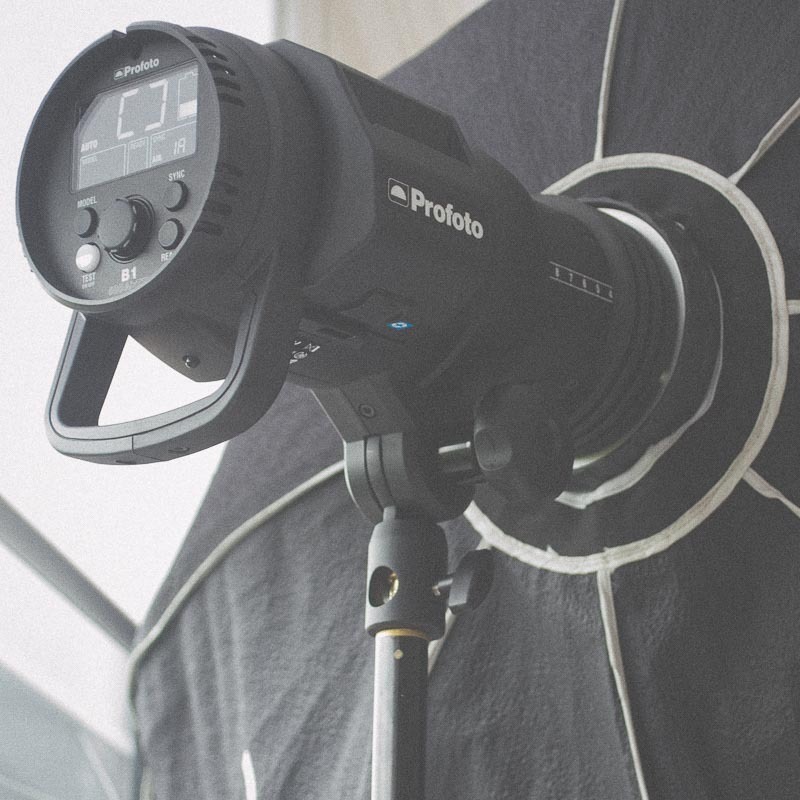 It’s easy to control the Profoto B1 with the Profoto Air Remote TTL-C. Image by Fatima. This system gives you the possibility of executing a shoot without the help of an assistant because you can control the power of the light with the Air Remote. Both the yoga and run shoots could have been done alone (the run shoot was). The issues that may arise with going solo are twofold. One is that if conditions are rough (i.e. windy), an assistant can be a huge help. They can hold on to the B1 as Fatima did in the fitness shoot to make sure the wind doesn’t blow your set-up over. This is more likely to happen if you use a large modifier like the octa. If you’re not attached to soft light, you can use a hard modifier in windy conditions more safely, but you give up your ability to get a particular look. You could bring enough sandbags to keep your investment (read: Profoto B1) upright, but then again you’re carrying more weight around with you (which is much easier to carry if you have an assistant). More weight on your light stand can also makes it more of a pain to move around if you’re getting different looks. The second benefit of an assistant is that you can get them to move the light when needed which frees you up to check your results or discuss direction with the talent. Having someone else do the moving while you attend to other things helps save time. Profoto allows a 3-stop range for Canon cameras (7.0-10.0) and 2-stop range for Nikon cameras (8.0-10.0). In both cases, it is limited to the upper ranges of power. Although in most cases you’d need that extra power, it would have been great to have a larger power range available. If you flash is too powerful even at it’s lowest power, you’re either going to have to move the light back (which may change the quality of light) or add a neutral density gel to your setup. Neither are ideal solutions. This is the biggest drawback of the Profoto HSS system for the type of shooting I do. Since HSS is limited to higher power ranges, the recycle time of the B1 suffers. That means that it can’t keep up with continuous (burst) shooting. This is one of the great features of the B1 (without HSS turned on) as I’ve tested it to keep up with 12fps of the Canon 1DX up to 11 frames (almost 1 second of shooting) at a power level of 6.0. At the lowest power level of 2.0, the B1 can keep up with 12fps for 32 frames (almost 3 seconds of shooting). So you can’t use Profoto HSS to capture in-between moments or quick variations as easily. You can capture the peak moment if you have good timing and anticipation, but other moments will be lost. If you shoot deliberately looking for only the peak expression, then this won’t be a major issue for you. Since HSS works by firing before and after the shutter fires, you’re losing power because not all that light is hitting the sensor. You’re going to lose 2 stops of light as you enter HSS mode. From what I could tell you lose a stop of strobe power with each stop increase in shutter speed. I didn’t test this properly, so please check this for yourself. Get used to seeing the battery drain when in HSS mode. Image by Fatima. 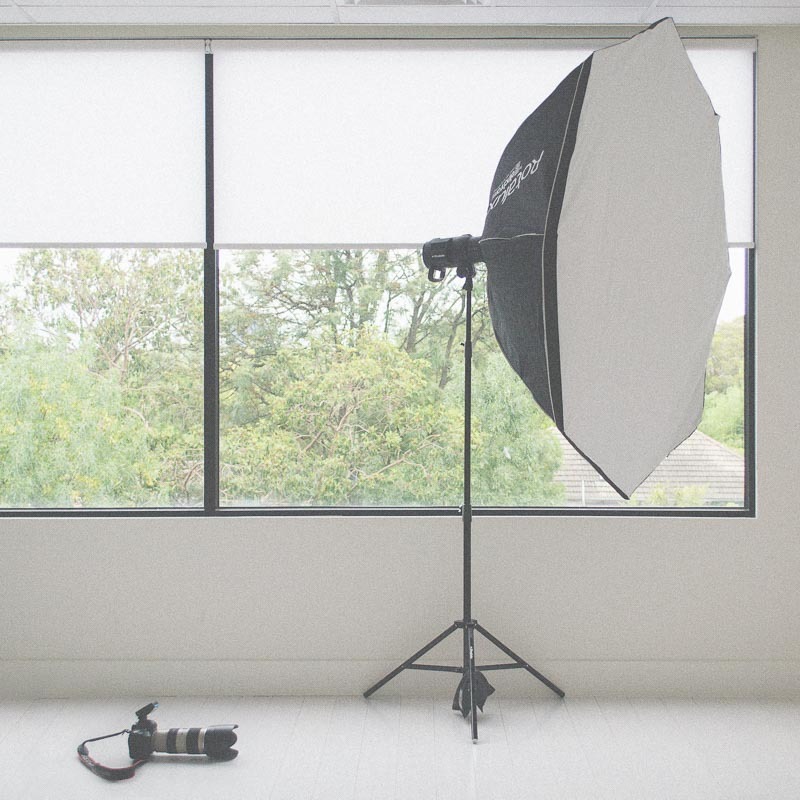 Although you get the same number of flashes according to Profoto, the effect of light loss means that you’re not getting the same bang for your buck. Also, since you’re limited to the top end of the power range, your batteries will deplete sooner than if you were able to use a lower power. That means it’s a good idea to have a second (or even third) battery on set since you may run out of juice. I tend to shoot real people, actually doing that activity I’m trying to capture. I don’t often “fake it” as I find that real movements have a different quality that I prefer. Due to the slow recycle times I have to be more selective and patient with what I capture. 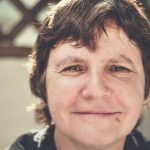 This isn’t necessarily a bad thing – in fact I think slowing down can be a really good thing – however it does mean that you may need more time to capture all the options you need. The Profoto HSS system only works with Canon and Nikon systems, period. If you have any other brand of camera, you’re out of luck (at the moment). Neil van Niekerk noticed to other potential issues to do with colour shifts and uneven flash exposure that I didn’t notice in my tests (scroll down to his summary). Overall the Profoto HSS system works as advertised and allowed me to sync my B1 with shutter speeds up to 1/8000 of a second. Pretty amazing stuff. The Profoto HSS System here with a Profoto Air Remote TTL-C on a Canon 5D Mark III and a Profoto B1 on a lightstand with an Elinchrom Octabank. Image by Fatima. I can’t think of a better solution that’s available at the moment to get these kinds of results unless you get into the next level of gear (and price). I believe it would be invaluable for clients to work with a photographer who has access and experience with the Profoto HSS system depending on what they’re looking for. 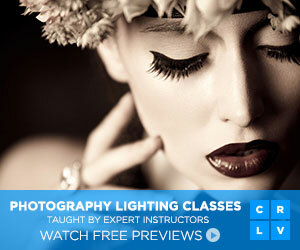 The Profoto HSS system opens new doors for photographers to express their creativity. Before jumping right in, you need to be aware of both the advantages and disadvantages of the system. Just like most other things in photography, there are limits to what you can do and it’s up to your problem solving skills and experience to execute your creative vision. I’d love to test out the Hypersync system that PocketWizard has developed to see how it compares. According to their website, it should work with any strobe that has a long flash duration. I expect that it will also have issues at lower powers, since they usually have a shorter duration. In an ideal world, camera manufacturers would be able to create an affordable global shutter. This would allow them to get rid of the mechanical shutter that creates flash sync issues. Perhaps this would allow us to use any flash, at any power at any shutter speed. It may no be possible, but a guy can dream can’t he? Thanks to both Tayla and Dezeraie for their time, energy and for taking time out of their weekend to test with me. This shoot couldn’t have happened without Natascha from Vicious Models who teed up Tayla for the shoot. Also, a special thanks to Fatima for assisting during Tayla’s shoot and snapping the behind the scenes shots you saw in this post. Hope you enjoyed this Profoto HSS review and that it helps you understand what the High Speed Sync on the Profoto B1 can do for you. If you did find this post helpful or have any questions please comment below. If you’re interested in keeping up to date with what I’m up to, either follow this blog or sign up for my newsletter. If you’ve enjoyed this post, please consider sharing it with the world! 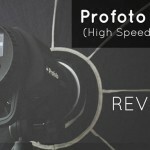 9 comments on "Profoto HSS Review"
Great review Matt, it was certainly thorough enough without going into too much detail and easy to understand. I clearly love what you do and have always wanted to experiment further with strobes of this nature, however the one thing always holding me back is the slow recycle time for my line of work, but like you said this slowing down can be turned into a positive. Nice work! Thanks Lyndon, happy to hear you found it helpful. The slow recycle time is an issue for me as well, so hopefully that’s something that Profoto can address in future products. I’ll be borrowing the new Profoto B2 this weekend and am looking forward to putting it through it’s paces. I will specifically test out the recycle time in both HSS and regular sync. Will post the results up on the blog so stay tuned! I am truly amazed at how the subtle rim of light really creates such a powerful image. I tend to stick to shooting with natural light as I have always felt that using artificial was too difficult. This is such a well written post that I feel like I understand something about artificial light now, enough to give this a try. Would you say that these tips would work in food photography? To create a beautiful rim and give the image more power? Hi Rachel, thanks for your comment and question. The techniques used to create rim light could definitely be used in food photography. Since food is often still life (although some photographer do use movement as well, you need for HSS isn’t as important than for other applications. The only time I can see HSS being helpful would be in cases where you’re balancing with a bright natural light and want to keep the depth of field quite shallow, or in cases where there are parts of the scene that are moving faster than 1/200 of a second can capture (i.e. a picnic outside with kids playing and people in the frame with the food). If you don’t need HSS you could look at other lighting solutions to get the look you want. The nice thing about the power of a big strobe like the B1 is that you can either make it your rim light (and leave natural light to be your main/key light) or vice versa, where the B1 is your main/key light and the sun is your rim light. It take practice and patience to shoot with artificial lights but it’s definitely not too difficult! Give it a try and let me know how it goes. Thanks for detailing the power range during HSS. It’s often overlooked in other reviews and I appreciate you discussing it. I too do not like the overly flashed look and it would be nice to be able to shoot HSS with a lower power setting. You’re very welcome Ty. Since the B2 has less power but has HSS available over the same power range, that could be a solution. Or I believe the new strobes by Elinchrom have bulbs that can be used at any power with HSS. Do you still use the B1 system? Have you found any major negatives when using it for the HSS required shoots?? I only ask as I’m looking at either the B1x twin light kit or also looking into the Broncolor Siros L 800 kit, which uses HS and doesn’t suffer from the same drop in power as the HSS systems do. Just chasing your thoughts on the Profoto! Good question! I do still own and use the B1 system. The three main negatives I’ve found are the the batteries can’t be trickle charged (moot point if you’re shooting at a location without plugs). If you’re out in full sun, you’re likely to be shooting at full power which will only give you between 240-325 shots. Second is the fact that the set up is top heavy, which depending on your modifier might require an assistant to make sure that it doesn’t fall over. This won’t be a popular opinion, but I actually prefer the generator/head combo, as that way if the set up does fall over, I’m just replacing a head. It also means that a voice activated lightstand (a.k.a. assistant) can more easily hold and move a light source since the weight isn’t all at the top. I wish that there was a portable 500-1000 WS options similar to the Profoto B2 (Elinchrom has some interesting options). Thirdly, there is a drop in power as shutter speed increases. So if the HS of the Broncolor avoids this, it could be a huge benefit (especially at 800WS). My only caveat comes from having issues when using the Broncolor Move with their RFS transceiver (I can’t remember if it was HS or HSS). Basically I was getting banding at any shutter speed beyond 1/500sec. Supposedly there is a way to tweak the trigger to get better results, but I didn’t have the time or know how to do it before the shoot. If I owned it, I’m sure that I would have figured it out, but because it was a rental, it was super annoying. I gotta give Profoto credit that their TTL transmitters just work (as long as you have the most recent firmware). So there is no easy answer. I’d say it depends on what and how you shoot. Let me know what you decide!